Cracked tooth syndrome is a tricky dental issue to diagnose. Cracked tooth syndrome is when your tooth cracks, but the crack is so small that it can’t be detected with an x-ray or it is under the gums. 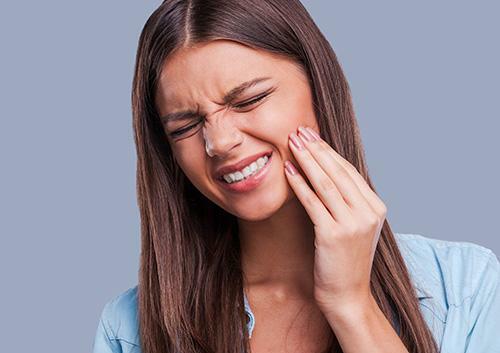 Often times the first sign of cracked tooth syndrome is a discomfort or pain that comes and goes when chewing or when your tooth is exposed to cold or hot foods and liquids. Cracked tooth syndrome can be caused by a number of things. One of the leading causes is clenching or grinding your teeth. In fact, if you know that you clench or grind your teeth, you should speak to your dentist about possible treatments in order to prevent cracked tooth syndrome. Other causes include the position of your teeth. If a tooth is not positioned correctly it may exert too much pressure on a neighboring tooth which can lead to a crack. Finally, teeth with large fillings or a tooth that has had a root canal are more susceptible to cracked tooth syndrome. Symptoms often persist for months before a diagnosis is reached.Your dentist will need to perform a complete oral exam and review your dental history. Radiographs and a fiber optic hand piece can help determine if you have cracked tooth syndrome. Once your dentist concludes that you are suffering from cracked tooth syndrome, there are three possible methods of treatment. The treatment will depend on how severe the crack is and where it is located. Your dentist will either meld the crack and install a crown, conduct a root canal, or extract the tooth altogether. If you suspect a crack in your tooth it is imperative that you set up an appointment with your dentist immediately. Cracks, even small cracks, can lead to serious issues if left untreated. If a crack gets bigger, a piece of tooth could break off, leaving your gums and the tooth’s nerves exposed. Exposed soft tissues can easily become infected, causing an abscess to form.